So you thought that all there was to cosplay was dressing up in costume like your favorite manga, videogame, or superhero? WRONG! 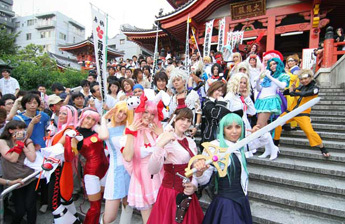 There’s tons to know about cosplay and you can learn how to make costumes, get your hair and makeup professionally done, and recreate scenes at the Cosplay School being offered at the 2008 World Cosplay Summit in Japan. In addition to being schooled you can also tour Akihabara in costume and go to the Cosplay Parade, which they claim is the largest cosplay parade in the world. To top it all off, a Cosplay Championship where the best performers in the world will face off and (we assume) prizes awarded. We’ve always known gadgets were cooler in Japan – seems the same holds true for Cosplay. This is like the summer camp we always dreamed about but never thought existed. Sugoi!!! 2 cosplay mentions in the same week. Gadget Madness is BACK!